Dr. Tolbert is a retired disabled military veteran who has been called to teach the Word of God and bring God back to America. Having a Masters in Theology and a Doctorate in Education, Dr. Tolbert has written many books and teachings on Christianity, as well as advising the White House, concerning the Federal Governments position on the First Amendment and the impact on Christianity and the violations of the Johnsons Act 1954. Dr. Tolbert has written articles to help bring God back to America. This Go Fund Me is to help cover Dr. Tolbert’s mission and travel expenses. He is a retired US Army E8, Pastor and Doctor of Education. 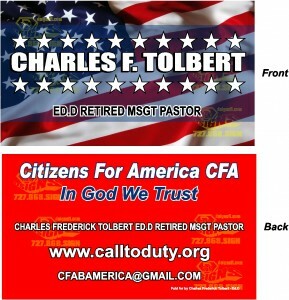 Charles Frederick Tolbert EdD is traveling to bring God back to the American people. Dr. Charles Frederick Tolbert is a man of God (Apostle) and his Assignment and Commision began on January 1999 to bring God’s blessings and understanding back to America. His new work began with being an elder in several ministries, degrees in theology (DivM) and education (EdD) in addition taking care of several senior citizens in his home, and prison and street ministry. Dr. Tolbert has written and continues to write new books which are available. He is currently traveling to several countries as did the 25 Apostles who were given assignments like men of God in the Bible. His writings are available and his ministry is a 501(c)(3) CFACS, inc (Christ Found All Creation Saved). God has instructed him to open new doors in His works. We are requesting your prayers and gifts so he can fulfill this mission that he has been assigned by The Trinity (The Father, The Son, The Holy Spirit). Download web links of his books and please donate to CFACS inc, in order for this Man of God to continue his work of bringing God back to America. This book was written by Dr. Tolbert, given to him by God which outlines 82 principles on how to reach your goals and your calling. The general goal of this paper is to: influence ministers to teach the importance of pre-marital counseling, so that Christian couples can increase their chances of having a successful marriage; specifically to direct the couples toward positive role models before problems occur after marriage. After analyzing the pros and cons of pre-marital counseling, versus after marriage counseling, ministers will be able to relate the use of teaching styles and how they can help change behavioral patterns. This is for all who are interested, not just ministers. Tolbert’s theses for his masters degree in theology was based on the book of Hebrews. Jeremiah 33:3 states “Call to me and I will answer you, and I will show you great and mighty things which you do not know.” I say this because the land of America claimed that they are a land of great opportunities and their motto states “in God we trust” that is what is written on all their currency and if they do not acknowledge God, God will surely do His own thing. This is a reminder for the people to know that they have to come back to God and put Him first in their country and in their lives. 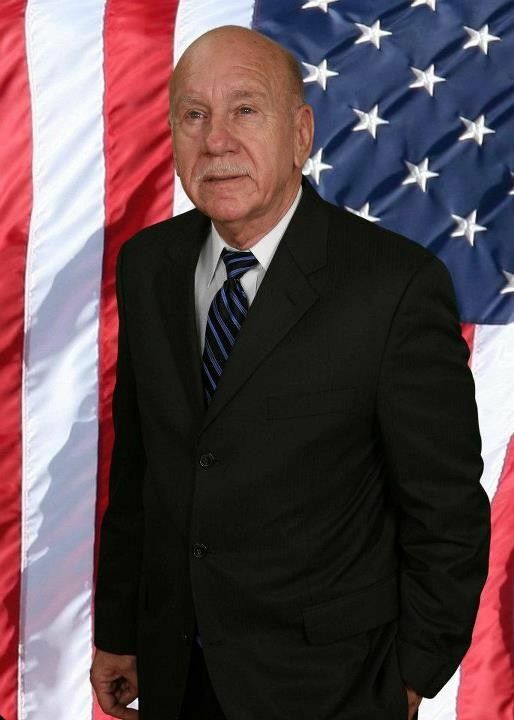 ‪In addition; Dr. Tolbert be placed in charge of the voters who are senior citizens, NPA and our retired Military.